Where do I use my Watch Shop voucher code? Click the voucher you wish to redeem and copy the code that appears. Follow our link to The Watch Shop website. Shop for your perfect watch and when you’ve found it, click ‘Add to Shopping Basket’. Then review your basket and paste your code into the ‘Voucher Code’ box and click ‘Apply’. Check your discount has been applied, and checkout. 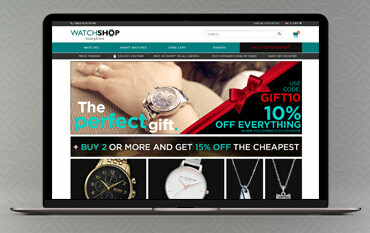 The Watch Shop bill themselves as the UK's number one source for great deals on watches when you're shopping online. Put them to the test - check out their wide choice of men's and ladies watches, jewellery and kid's watches yourself! Brands include Accurist, Calvin Klein, Emporio Armani, Fossil, LTD, Police, Rotary, Seksy, Swatch, Tissot, Dreyfuss Co, French Connection, Gc, Guess, Hamilton, Hugo Boss, JT Windmills, Juicy Couture, Karen Millen, Kenneth Cole, Marc Ecko, Michael Kors, Moschino, Nautica, Nixon, Obaku, , Seiko, Sekonda, Superdry, Technomarine, Ted Baker, Timberland, Victorinox Swiss Army, Zodiac and more. Whatever your preferred style and taste, whether its cutting edge, modern designs or more of an ageless classic, you will find exactly what you're looking for in the Men's Watch collection. With sports watches featuring the latest brands including Casio G-Shock and Citizen, all packed with special features which any budding sportsman could need! Find more versatile styles perfect for casual wear or occasional purposes. From Armarni Exchange to Diesel, Sekonda and so much more, find your next watch today! Enjoy the extensive collection of Ladies Watches today at Watch Shop! Featuring over 170 brands in endless styles, shapes and colours, you're sure to find the perfect watch for you or the special lady in your life. Make a statement with a bold design or add a touch of sparkle with the likes of Michael Kors, Marc Jacobs and so much more where the jewel-encrusted designs are sure to complete your outfit with that glamorous feel. Keep things casual with a Swatch or Casio watch, maybe you're the sporty type and are looking for a performance watch from Adidas or Baby-G? Whatever your preference, you're sure to find it with Watch Shop. Established in 1991 on the high street, Watch Shop is a leading retailer of 'big brand', designer watches and is also the UK's most popular watch website. Watch Shop was the first independent watch retailer to advertise on national television, priding themselves on having one of the most efficient shopping systems available, with communication at every stage to inform you of your order status, as well as excellent 7-day sales, customer service and a support team who are glad to assist you with any enquiry. A Watch Shop voucher code offers excellent discount across their store which all can be found on our website. Check them out now and save money on your next order. We are constantly on the hunt for first order Voucher Codes for Watch Shop to help you with your money saving. Our experts check dozens of sites for secret codes including NHS discounts, student sites & social media channels saving you time & money!